​Last summer, we spoke about harvesting potatoes tasks. 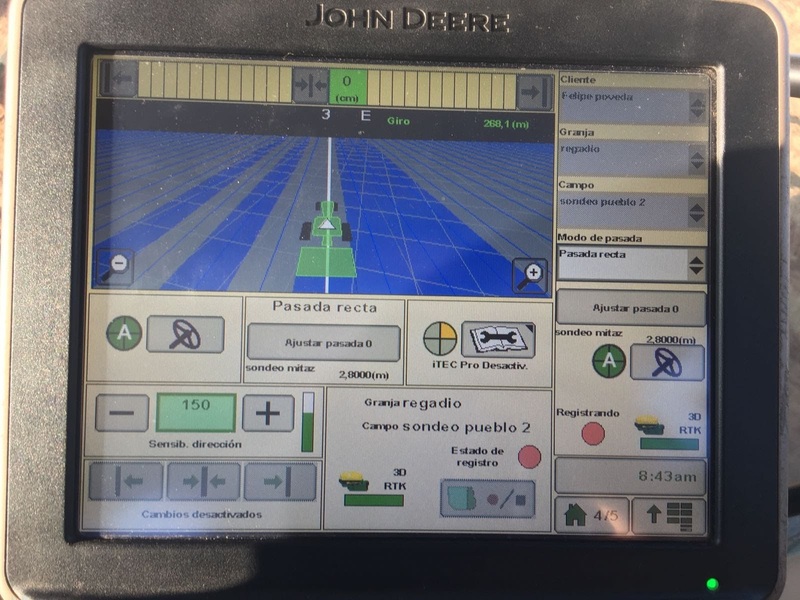 On this occasion, we have had the great opportunity to talk again with our friend José María with the aim to know the most important items about sowing potatoes tasks... We start! 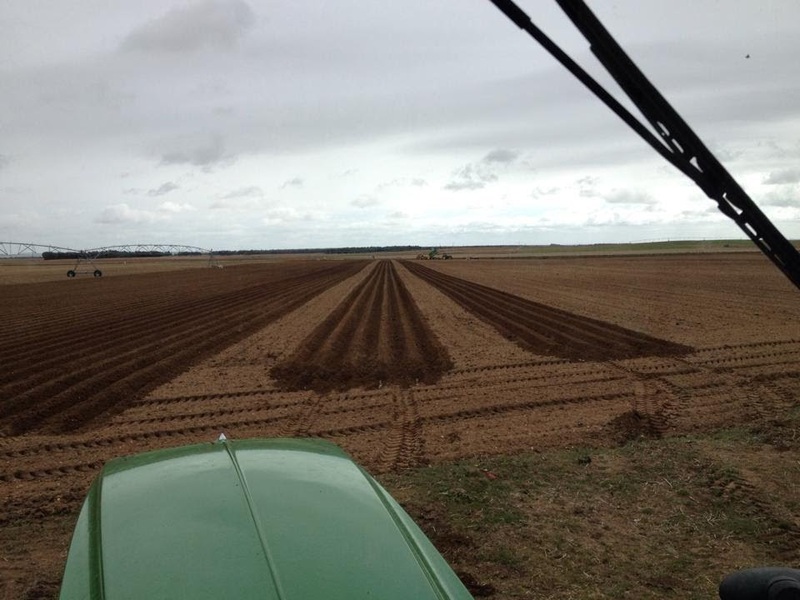 The seedbed preparation is really important before beginning to sow potatoes. 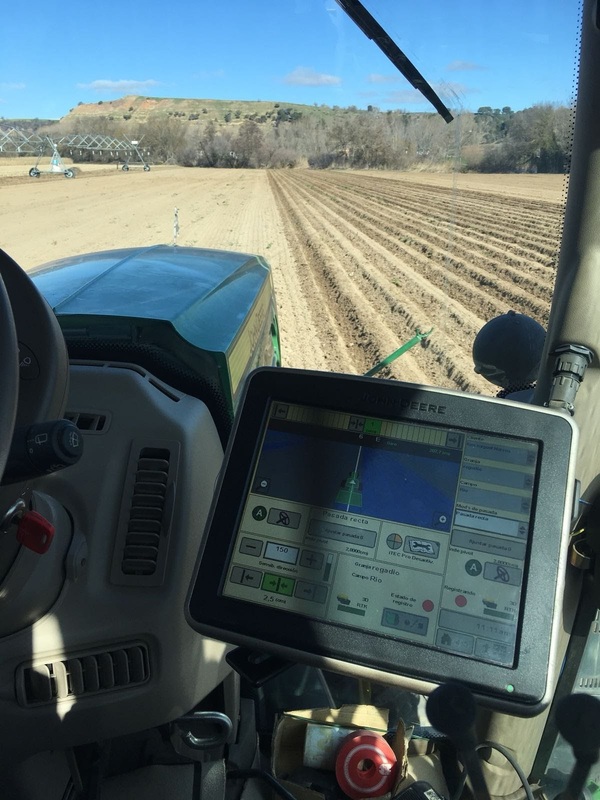 The soil has to be very ground, so they use rotary harrows for that. 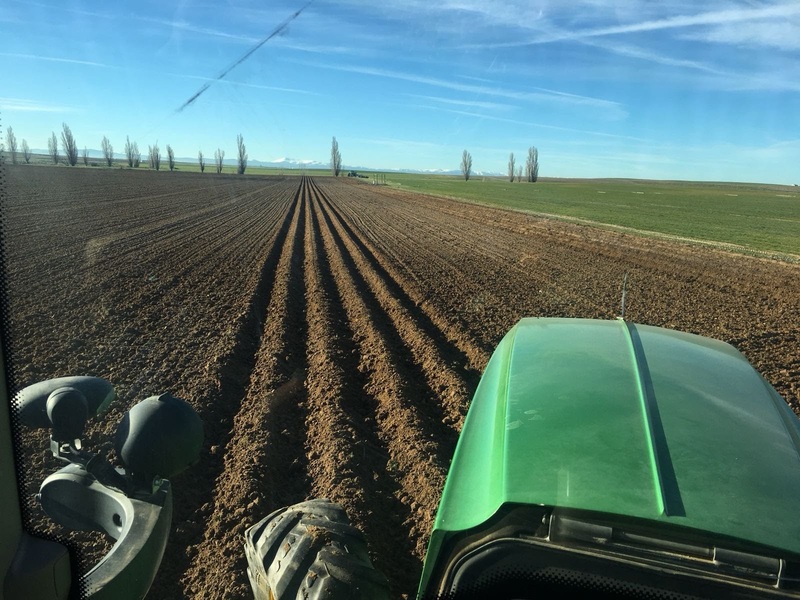 The main goal is to avoid clods because they can damage the potatoes’ skin. 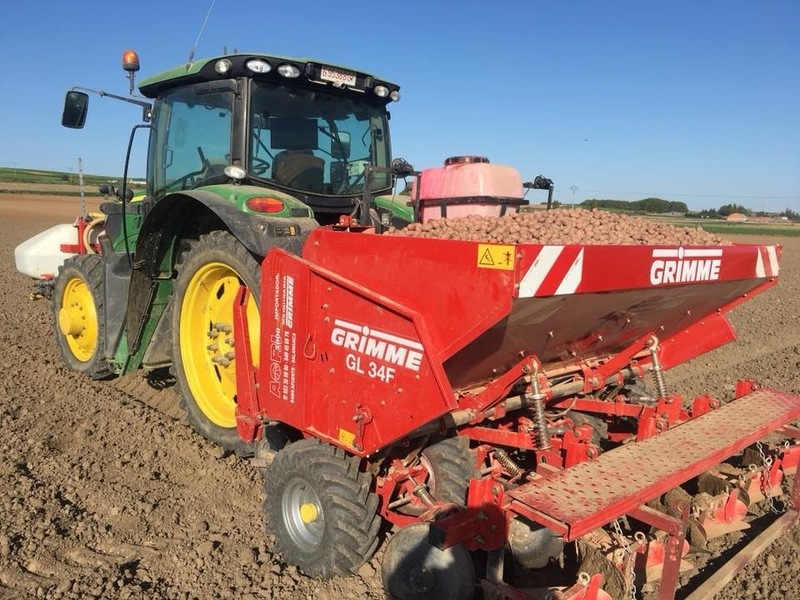 Also, it is important when they have to harvest potatoes because if there are a lot of clods, the harvesting work is more difficult and potatoes could be damaged in the screening and cleaning process. When the seedbed is ready to sow, they have to prepare seeds. In this sense, they can use different diameter (size), but 28mm-35mm, 35mm-45mm y 45mm-55mm are the most common. 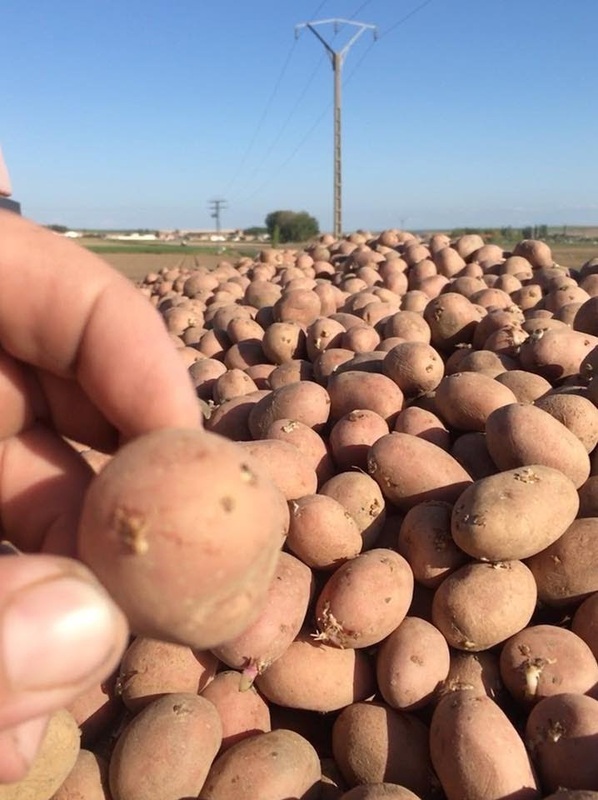 José María sows the smallest diameter (28mm-35mm) because he doesn't split potatoes. In Spain, "to split, or not split the seed of potatoes, that is the question"; this discussion is very typical. This fact is only performed in Spain and the main goal is to save money with seeds. 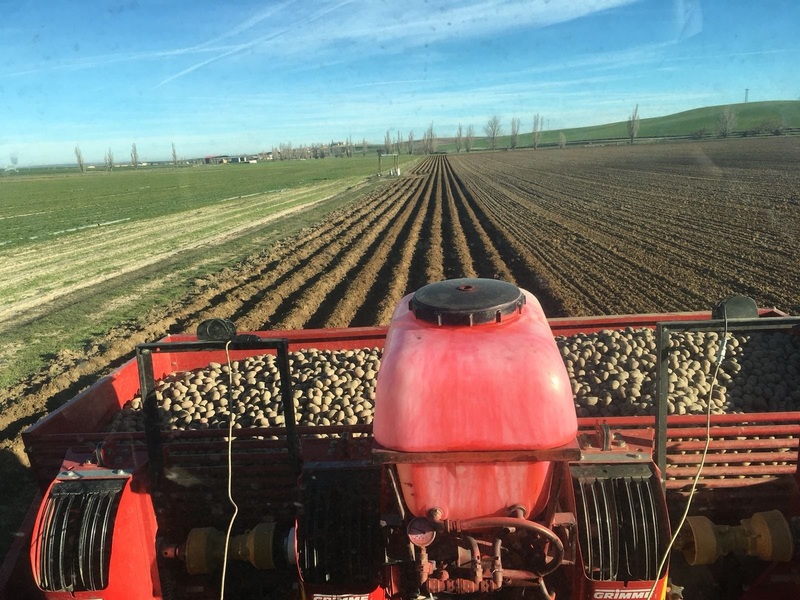 Potatoes can grow without problem when they are split but farmers have the risk of transmitting diseases in the machine that is responsible for splitting. 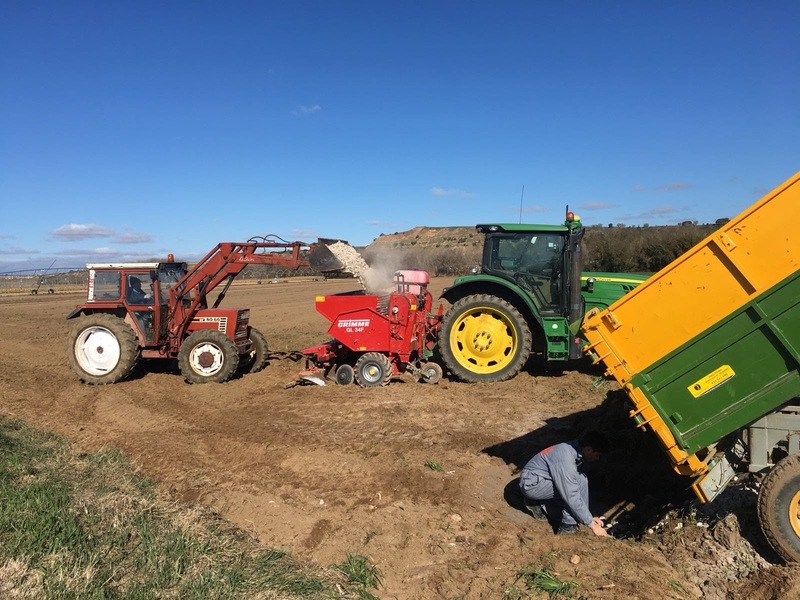 Normally, if farmer sows big diameter of seed, he has to split seed so he has to buy little seed and cheaper (small sizes are more expensive since they are more complicated to get) and seed are multiplied. The price of seed (small diameter) is about 1​.2 €/kg. 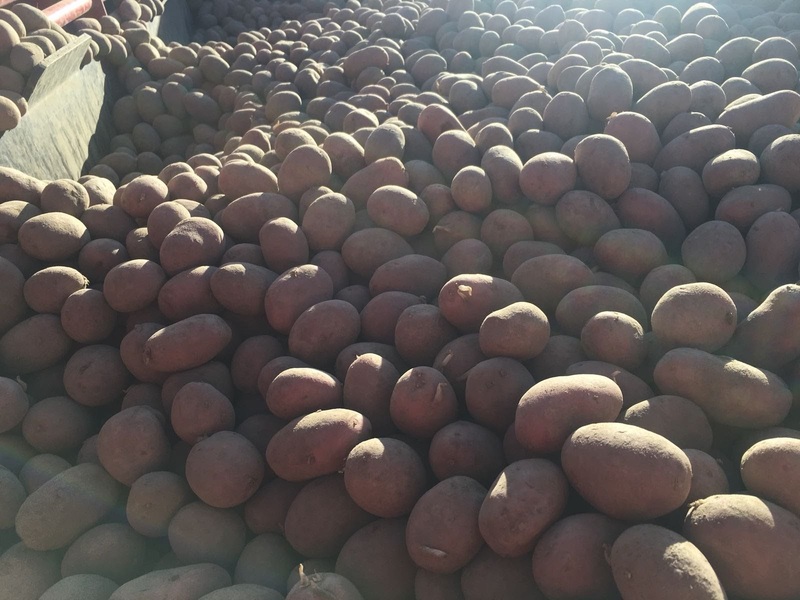 Regarding the dose of seeds, Jose María uses about 1.100 kg/he so it is about 42.000 potatoes/he with 28mm-35mm of diameter.​ Each kilogram of potatoes sowed usually produces about 45 kg ... more specifically each potato usually produce about 15 potatoes. 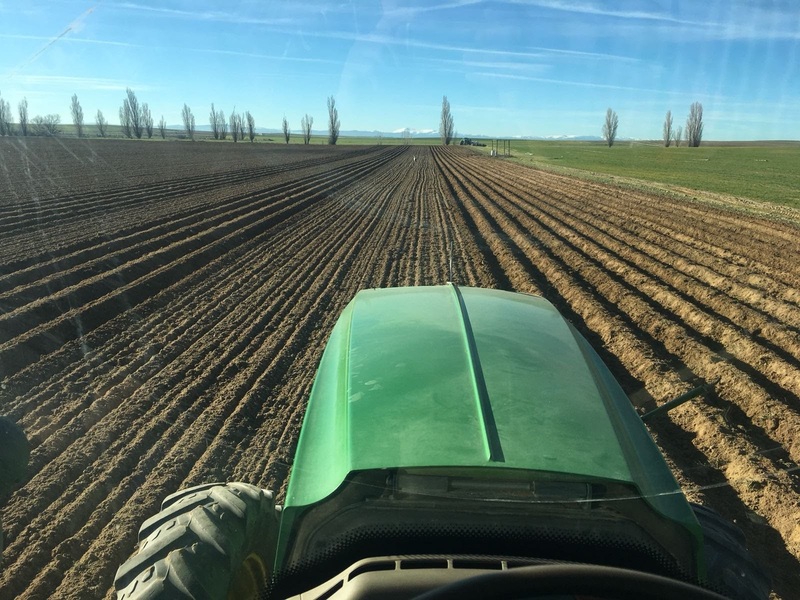 As you can see in Jose María's pictures, he uses a Grimme GL-34 planter of 4 rows with a hopper of 1,200 kg. He can sow about 10 he/day at 7 km/h. 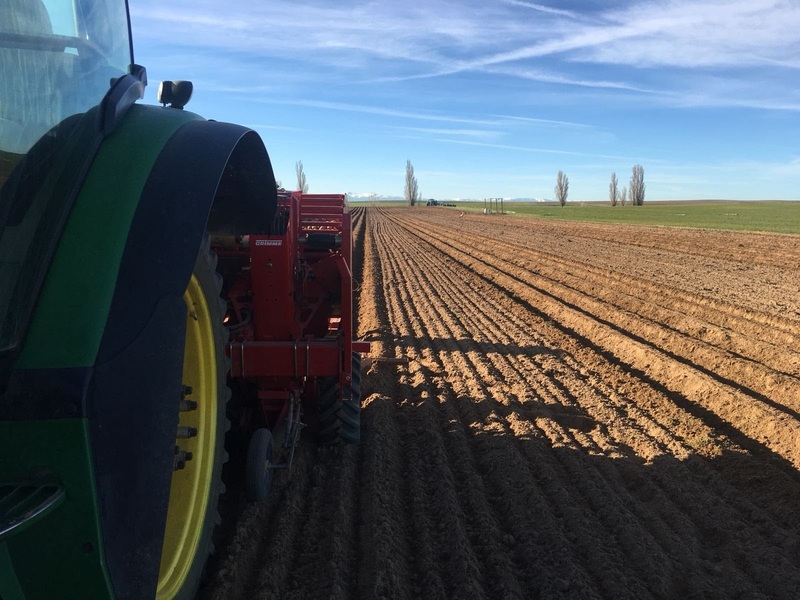 The distance between rows is 75cm and the potato is buried about 10cm. 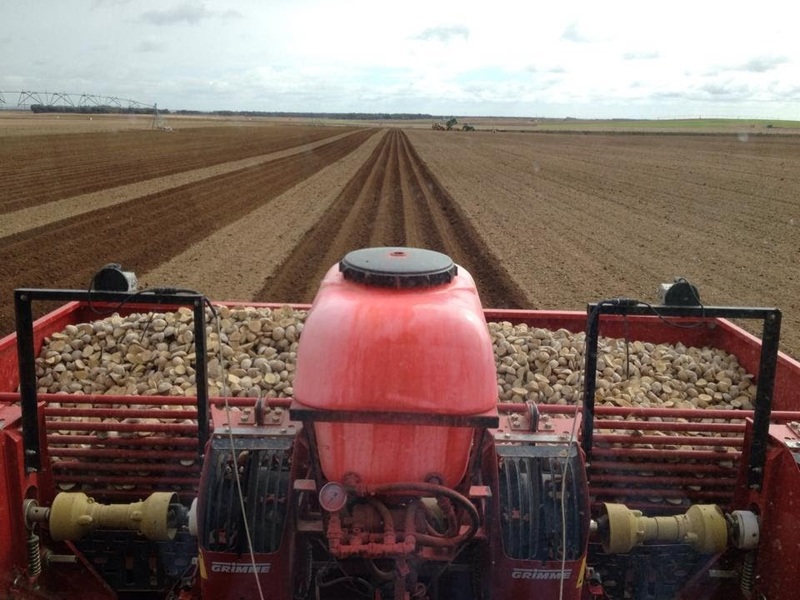 The planter Grimme has a system to inject a long-lasting insecticide to prevent potato beetles. This insecticide is effective in whole life of potato plants. 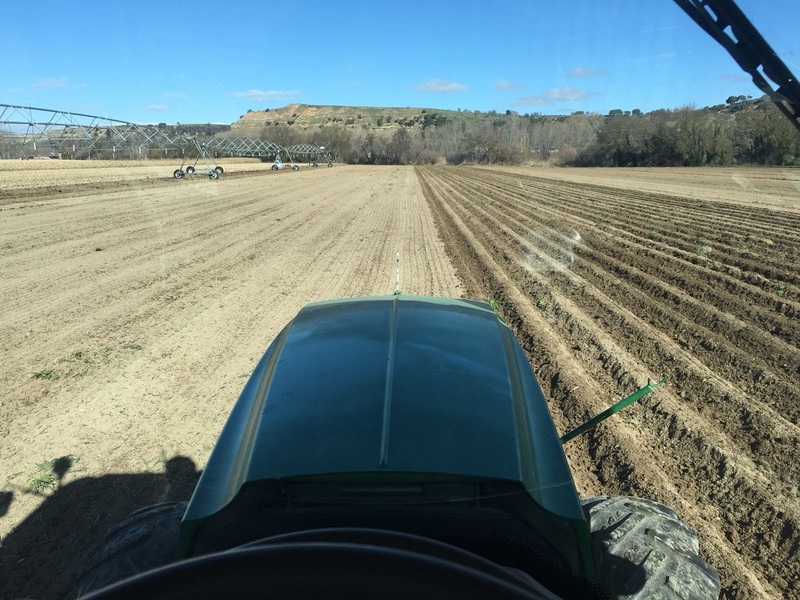 The distance between rows is large because potatoes need an important area to grow. 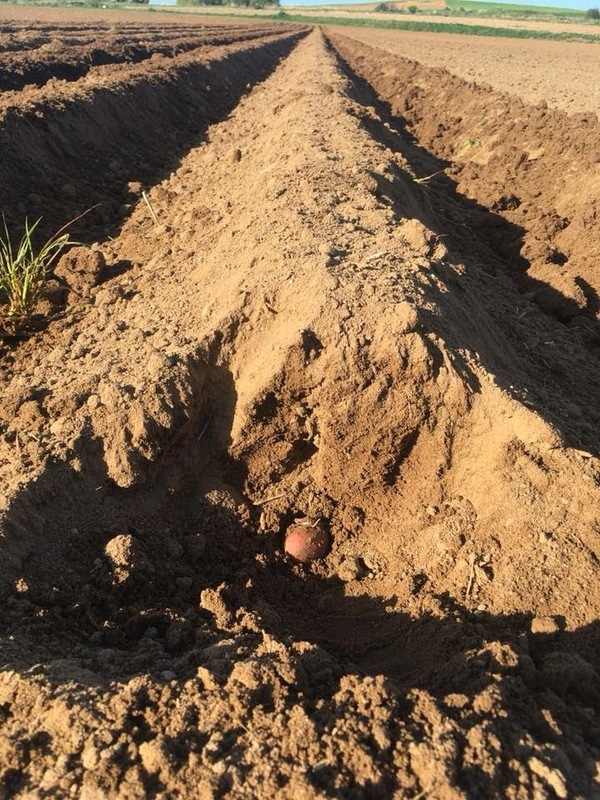 If potatoes are not buried, their skin is damaged by the sun and the environmental conditions and they will be green potatoes. Besides, the production is quite numerous as we have already commented. 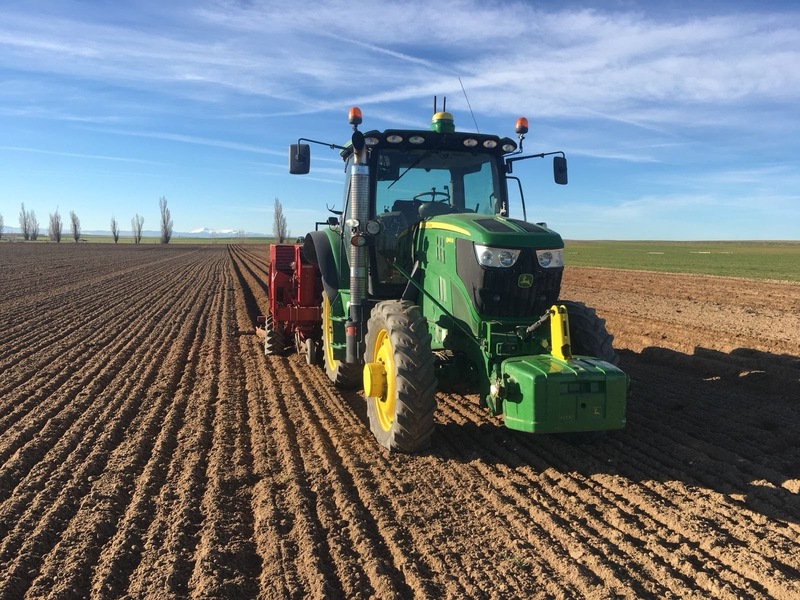 This year the sowing tasks are being delayed due to the rains, so it will surely generate a loss of production since the cycle of the plants will be affected... they can’t delay harvesting tasks because they could have problems with meteorology in September or October. The potatoes take about 20 days to grow up and until they are 15cm height they won't start to be watered ... we will talk about all these questions later.